Decks are everywhere, and they need a tremendous amount of maintenance. This can be a small part of a mobile wash compan’s business or it can be the entire business. Many decks need annual maintenance. It can be the small things that make the difference between success and failure. Prepare for the job by protecting adjacent house siding from over spray. Any thing underneath the deck like house siding or other decks must be protected. Take steps to assure that the surrounding plants don’t get damaged by your hoses or stepped on. Clear items off the deck and far enough away so they don’t get dirty. Be ready to sand areas where standing fibers are a problem. Conference with your customer in advance about spots that probably can’t be completely restored, like burned areas, leaf stains, etc. On the majority of decks Restore and Deck & Shake Brightener will do the complete job. Some decks require actual stripping and when this is the task at hand you should use FiberX. Decks with fresh stain or paint fall into this category. Pressure washing a deck can usually be accomplished with relatively low impact pressure. Giving people exact PSI ratings to work with is not constructive. Just like with any pressure-washing project, decks should be washed with enough pressure to remove old fiber and pollutants while not damaging the wood surface. Anyone stating the exact pressure to use to accomplish this is simply picking a number to have something to write down. Wood is naturally soft in some spots and harder in others. It requires more pressure to wash where the wood is hard. The wood is damaged easier where the wood is soft. How much pressure to use and how close to the surface to get is decided by using educated judgment. It is learned with practice and you can’t become an expert by reading about it. Learn by doing on your own deck, or on a relative’s deck. Anything you may damage will be repairable. Consider it the cost of educating yourself. Restore for general cleaning, Deck and Shake for brightening and FiberX for removing as much of the old stain as possible are all excellent products to use for deck cleaning and restoration. They are also an extremely safe product to use. When applied to the wood surface they lift the old wood fiber from the healthy wood underneath. This makes the weathered fibers easy to remove with a pressure washer. Restore will not fade the woods natural color like bleach. When using Restore or FiberX you don’t have to be concerned about plant damage either. Both are mixed from powder to liquid on the job site and must be used immediately. 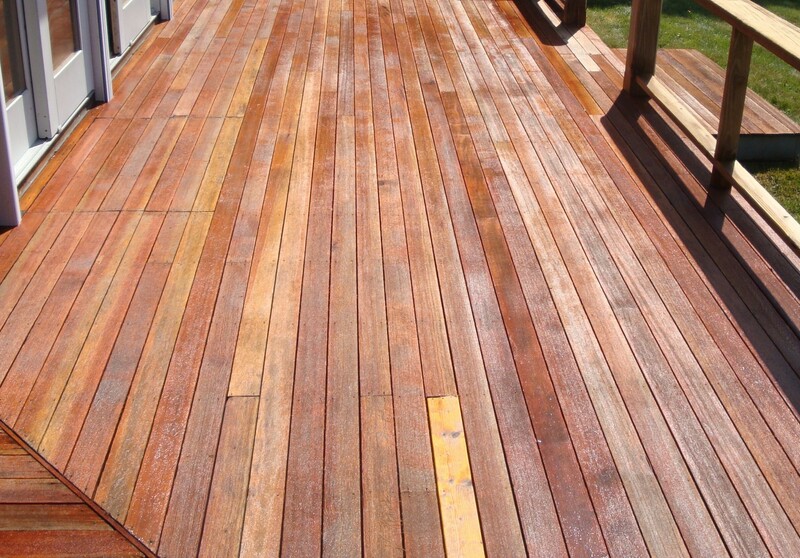 It is direct sprayed onto the deck using either a compressed air sprayer or an electric sprayer. The dwell time prior to washing of 15 to 20 minutes is very important. Deck & Shake Brightener is applied after using restore or a stripper. The colors in the wood are brightened while the wood surface is Ph neutralized. Using this product enhances the overall appearance of the restoration job.